90 x 450mg Veg. Caps. Guggul for slimming and cholesterol control; Commiphora Mukul extract, standardised to 3.23% Guggulsterones (E & Z) by HPLC. 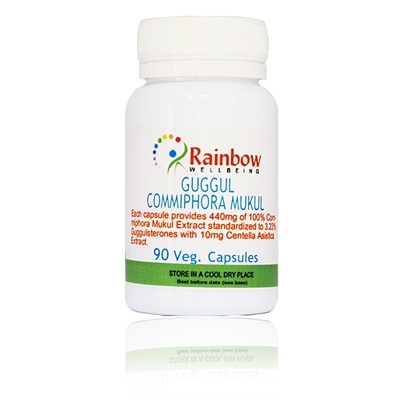 Guggul has demonstrated in more than two dozen clinical trials, its incredible lipid-lowering properties. It not only lowers total serum cholesterol and plasma triglycerides, but also greatly reduces 'bad' cholesterol (LDL cholesterol). While at the same time increasing 'good' cholesterol (HDL). This should come as welcome news to those who worry about their heart arteries or livers becoming clogged up with too many fat deposits. The evidence was strong enough for the Indian government to approve guggul as a treatment for high cholesterol. It appears that guggul can lower cholesterol by about 11 to 12% and triglucerides by 12.5 to 17%. Another remarkable accomplishment of guggul is its ability to accelerate the chemical 'burning' away of stored fat, by simply converting it into more physical energy. This is done by resetting the body's own 'fat thermostat' a few degrees higher (not to be confused with an unhealthy rise in body temperature). All this action takes place in the thyroid, that butterfly-shaped gland that sits on top the windpipe at the base of the neck. When Indian scientists administered and isolated ketosteroid from gum guggul to animal models, they noticed, according to their report 'a significant increase in all the thyroid functions' of these rodents. And slightly accelerated thyroid activity with guggul means an increase in the body's overall metabolic rate, or heightened internal combustion of stored fat. Guggul is safer than much of the water we drink or air we breathe these days. It is extremely user-friendly to all body systems and will do our internal vital organs much good if taken in moderate amounts (2-3 capsules) each day, as a maintenance dose, with meals. Each capsule contains 440mf of guggul extract plus 10mg of centella asiatica. No other ingredient or additive of any kind.